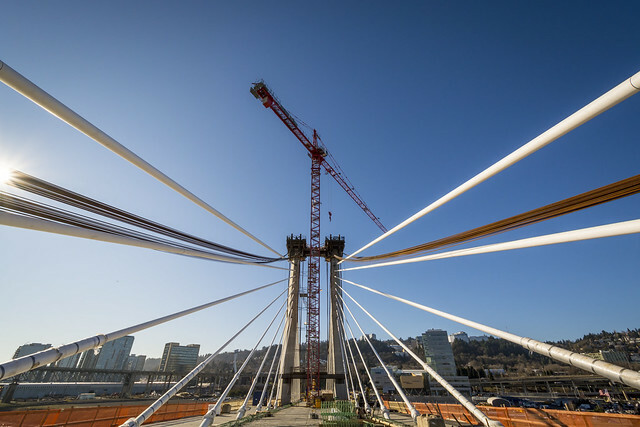 Cables on the west tower of TriMet’s new car-free bridge over the Willamette River. 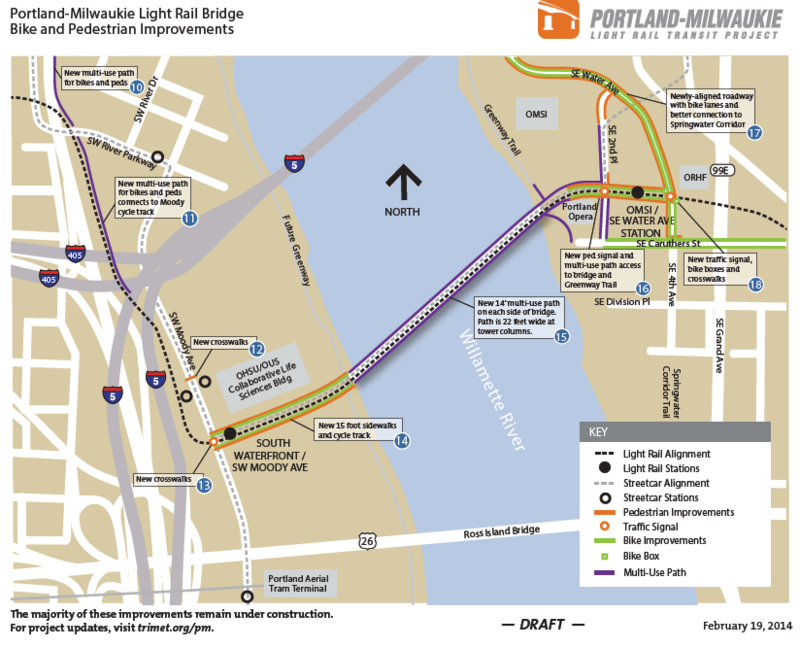 The 7.3-mile light rail line opening next year through the South Waterfront, Southeast Portland and downtown Milwaukie will, of course, build a new car-free bridge across the Willamette, the biggest such crossing in the country. But even if you don’t count the full $135 million bridge, the Portland-Milwaukie Light Rail project will also include more than $40 million in bicycling and walking facilities on nearby streets. For comparison: in 2008, the city estimated the value of its entire bikeway network at $60 million. “It’s likely that this investment is the largest in the U.S. related to a light rail project,” estimates TriMet spokeswoman Mary Fetsch. 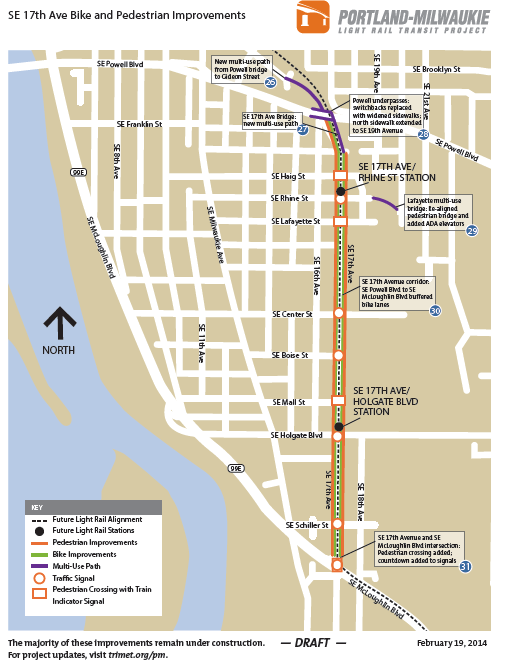 As residents of Southeast Portland’s Brooklyn neighborhood are already seeing, the new bike connections will dramatically improve routes in and out of that area, which for decades has been sliced off from the city by Powell Boulevard, Milwaukie Avenue and Union Pacific’s rail line. All three are getting new bike-friendly crossings, and 17th Avenue will get buffered bicycle lanes in addition to its new rail line. Click here to download a PDF with annotations. The inner Division Street area, where large amounts of bike traffic will be crossing the UPRR tracks, has already been changing. A two-block stretch of Caruthers Street will add the region’s first advisory bike lanes. Click the image to enlarge, or click here to download a PDF with annotations. At each side of the bridge, connections to the bike routes there will create a new 4-mile biking loop across the river in addition to the 2.9-mile loop created today by the Steel and Hawthorne bridges. On the west side of the new bridge, bike connections with Southwest Portland will improve, too, thanks to a new contraflow protected bike lane at SW 5th and Lincoln, that creates a new connection between the South Auditorium area to Barbur Boulevard. The bike improvements don’t stop at Portland’s city limits. In Milwaukie, the project landed an Oregon Department of Transportation grant to add a multi-use path on the Kellogg Lake Bridge, “removing a long-standing barrier for both bicyclists and pedestrians on and south of McLoughlin Boulevard to more safely and quickly access the south end of downtown Milwaukie,” Fetsch notes. If Geller had had his way, the effect would have been bigger still. 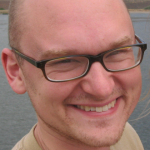 He unsuccessfully lobbied ODOT for permission to build a dedicated bikeway along SE McLoughlin Boulevard. But Geller said the Oregon Department of Transportation, which owns the road, wouldn’t allow one there in case it wanted to widen the road someday to add auto capacity. Most of the improvements shown on these maps will be physically in place by the end of 2014. Some, like the new 17th Avenue viaduct over Powell, are already open and in use; with others, Fetsch said, “we will be looking to see if some of the bike/ped improvements can be opened in advance” of the rail line operations in September 2015. She said she doesn’t expect the most important new connection, the bridge, to be open to biking and walking until the rail line opens in fall 2015. 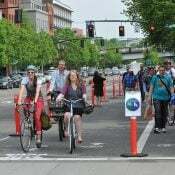 All these improvements are the result of five years’ consultation with the city’s bicycle and pedestrian advisory committees, starting in 2007, and much coordination among planners and engineers at TriMet, the Portland Bureau of Transportation and ODOT. 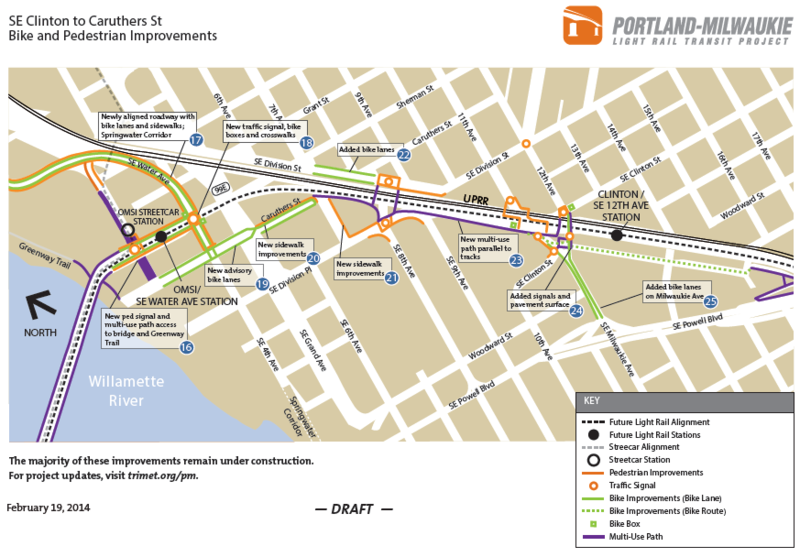 Jeff Owen, TriMet’s active transportation planner, said he’s eager for Portlanders to start enjoying a vastly improved set of bike connections just south of the city center. Owen said the bike improvements will increase the value of the rail line by making it easy for people to reach its stations and all the new buildings that TriMet and the city expect will rise nearby. 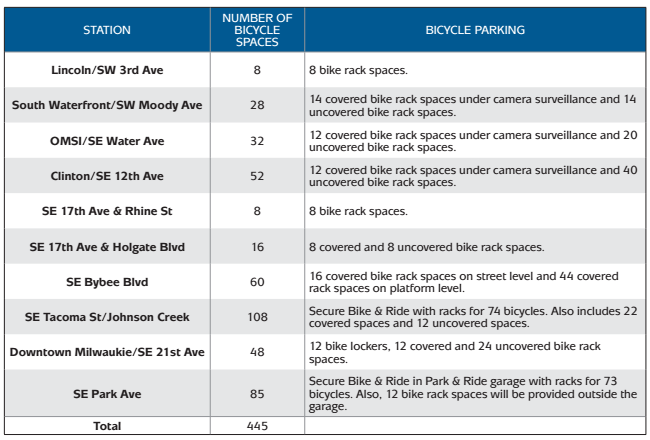 Correction 12:50 pm: A previous version of this post slightly misstated the number of new bike parking spots and the cost of the new bridge. Bravo! And to hear more about this project, come to the PBOT Bike Lunch and Learn on May 15th. PBOT’s Teresa Boyle will give a presentation on Bikeway Improvements of the PMLR project. Excellent, but it is a bit disappointing in retrospect to compare the results of this project with what resulted when the Yellow Line was put in. The positive response to the Orange Line related bike facilities should reinforce the need for dramatic changes along the Yellow Line in North Portland. I love it. Thanks PBOT! I can’t wait to use all of these new improvements. Umm, TriMet, right? Tho The City does have money in the pot, and I’m sure was supportive of the improvements. So thanx everybody! Is anyone missing the irony that the bikeway on the bridge that ODOT nixed will have more capacity than expanding the motor vehicle lanes unless there is a radical change in the number of people per car? Hahahaaa, yeah. I’ve thought about that a LOT. Instead of $4 Billion we’ve spent $1.4 Billion and are getting an order of magnitude more efficiency out of it, has a higher capacity, connects more people, to more things and more homes and more of life. All at a higher quality of movement and eventually something that can lead to improved livability and clean air, vs the $4 Billion dollar project which would have likely led to anything but those things. It will be exciting to see the traffic at Ladd’s Addition and leading up to the Hawthorne Bridge lessen. Yes. Let’s hope the city improves the bike infrastructure getting to this bridge, so more people in SE will want to use it. I’m really excited for the work on 17th to be completed, especially that MUP to Gideon. I didn’t even know that was happening. I was wondering why people were being abruptly dumped from a really nice MUP on the overpass onto Powell/how I was going to access 17th coming from the other direction without mixing with the heavy traffic. I just figured it was another case of disappearing bike lane. I stand corrected. It’s going to shave over a mile off my commute from NE Portland to Milwaukie, which’ll be great. I’ve been hearing fall 2014 as an opening date for bikes/peds on the bridge. Any sense of whether this is a firm new completion date update or an exercise in PR caution, Michael? Are you talking 2014 or 2015? I heard this too and asked them specifically about this. The question was met with laughter and a firm statement that the bridge won’t open to anyone until fall ’15. That’s all I know. Other bridges exist. It takes a long time to build a bridge. Stop being a baby. I have no problem with anything you said. I just find it insulting that they would laugh at Michael for asking that, instead of just responding that the bridge would be opened on schedule. It could have merely been a “oh dear, you give us too much credit, we’re nowhere done making it safe or finishing the tarmac surface of the bridge… we’ve got a LOT to do!” laugh. So sad… I guess they have their reasons. 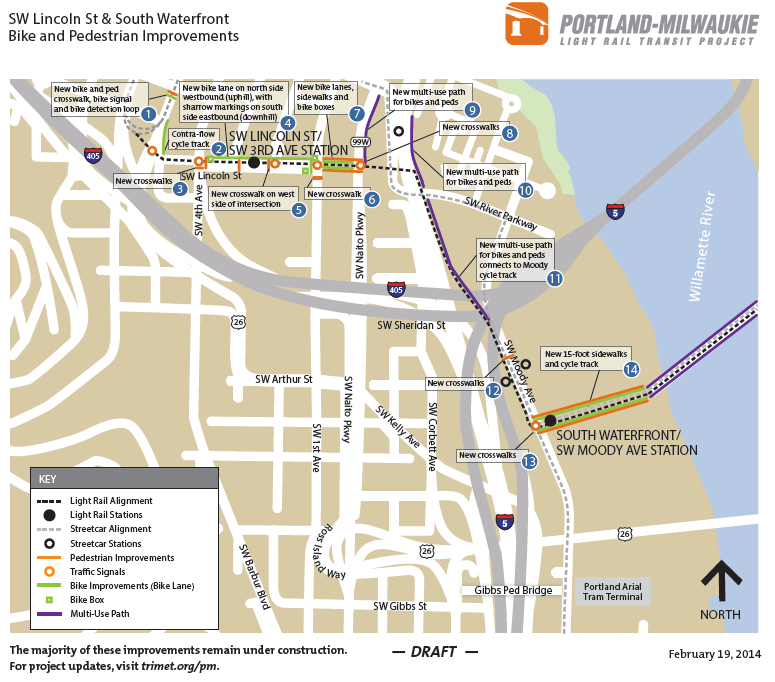 It’s good to finally get some clarity on how the connection between SE Water and Clinton will look. Negotiating the ever-shifting detours—And now you cross SE 12th without a signal! Ha!—has made me feel like the subject of a sadistic experiment. I am ridiculously excited by it. I’ll be using the heck out of it, and even get my wife now to take the max in to work and bike home. Now if they’re only do something about that f#@ckin Holgate bridge over the Brooklyn yards, it would open a big swatch of neighborhoods of bikers to that orange line/MUPs. The Lafayette ped bridge? It’s a pretty awesome heart-rate raiser as-is, and its funky nature keeps it from growing too crowded. If it weren’t for the ADA snub, I’d wish for it to be left alone. Oops, nope, you really did mean Holgate itself — which is, of course, nothin’ but bridge where it goes over the yards. Agreed. The new Lafayette Ped bridge over the rail tracks is still supposed to be linked to the ground with an elevator at each end, and the bridge itself will be a complete teardown and rebuild. Elevators are a good example of how this whole project will impact your cycle commute along the Orange Line in inner SE – by slowing it way down as you negotiate many new red lights, stop signs, and bicycle-specific traffic signalizations and signage, in addition to sharing many parts of the route with Tri-met, pedestrians and with folks waiting around Max stations. It will be a safer, although slower, commute. Keep pushing the city for the proposed SE Gladstone to Center crossing of the rail yard. City is wholly unwilling to take seriously any proposals that involve improving SE Holgate from 17th to 26th for peds or bikers. Did not know there was a crossing at Gladstone/Center. That’s good to know, I’ll look into that some more. Sadly I’ve been in touch with the city, BTA, and county trying to figure out if anything can be done on that brooklyn yard bridge. And you’re right, there’s no talk or will to improve it. Walking dogs or pushing a stroller along there in the rain with cars going by at 40 is a pretty awful experience. The city seemed to think that the rail company was in charge of the bridge. I haven’t even tried to approach that likely brick wall. Not a current crossing. Just a proposed possibility on some planning maps for this area. Keep hope alive. I have to say, seeing the word “secret” makes me nervous. These are all in the planning documents and where part of a public process. I’d hate to feed the trolls with words like secret bike projects. I hear you. In this case though, the word “secret” is being used to illustrate that most people aren’t aware of the bike/walk connections that will be built as part of the project… We’re not using to say anything was done in secret. And haters gonna hate, so there’s that. …let the conspiracy theorists pounce on this nugget of truth! The 2 halves of the bridge are sooooooo close to touching. Very exciting. Agreed. This area is really bad. Now they will connect the MUP to it, and when light rail users and pedestrians start moving through here, this will be a really problematic intersection of 4-5 streets, two train tracks, one MUP, and various ped walks. Not sure too many cyclists will use this area, at least not according to planned traffic flow as part of the new $40M in improvements. Poor design. I’ll probably switch back to Ladd or Division when they start running light rail through here. If there are bike signals for the crossing at that intersection, it may be a magnificent thing. I think the jury’s out until we get more details. Yeah, I’m not a big fan of at-grade railroad crossings. Especially when there are multiple tracks side-by-side. I predict a few accidents/year there. Although, the transit mall downtown works well. It actually reduces the number of rail crossings in this area from the existing number. The exceedingly cheap “dotted line of paint” advisory bike lanes in the mineappolis area have widely derided (and in some cases are being removed). I really hope that the advisory bike lane on caruthers is tinted — as is standard practice in northern europe. I think Geller said they’ll be painted green, but it wasn’t in my notes and I didn’t want to say this in the article without being sure. When will they retrofit the streetcar bridge form MLK to Water (over the RR tracks) to accommodate peds and bike? The fact that this built without sidewalks and bike lanes seems like criminal negligence to me! Does anyone know the backstory on this? This was asked at a past streetcar CAC meeting (sorry, I don’t recall which one), and it was state that the streetcar viaduct is of a sufficiently steep grade that sidewalks would not have met ADA requirements, and that therefore a separate facility would need to be budgeted/engineered/built for pedestrians. 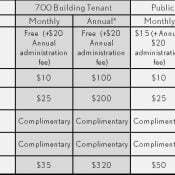 I have not verified whether this is actually true according to ADA regs. Obviously, you can build a sidewalk on the ground on a steep street, but if you are making a purpose-built structure perhaps the rules are more stringent. Nonetheless, this location is an obvious choice for a pedestrian/bike structure across the freight tracks. Thanks for the response. This sounds to me like a justification/excuse because you see sidewalks paired with bridges all the time, sometimes they are steep. I don’t think the streetcar can operate at very steep grades, though. If one examines the route options between Goodwill and OMSI for a bike/ped, and weighs that against a grade that may exceed 5%, I think it is clear that a sidewalk should have been included on the bridge. I would like to know if the Disability Advisory Commitee was asked to review this? Sometimes I wonder how much more broadly the ADA could be interpreted. This is infuriating. Not everything can be reasonably made accessible to wheelchairs. Just as not everything is accessible by foot or bike. End of rant. It’s wonderful to see so much invested, but there still seems to be a few flaws in the connectivity of the westside inflow. I live in SW/Beaverton and work in SE off Hawthorne. Currently I take Barbur to Naito (vehicularly cycling since there isn’t any bike facility coming from Barbur), over the Hawthorne. The new bridge would be wonderful, but it seems PBOT’s intended flow for people with my commute would be to stop at the crosswalk where Barbur/Naito splits, head North on Barbur into downtown, then head East at some point, then head back South, then East again, then across the bridge. In other words, a big ol’ broken dogleg with a funky angle, backtracking, using pedestrian facilities, at the mercy of car traffic to stop at a crosswalk. Let’s hope at some point the bike lane at Barbur can continue on through to Naito. Wonderful bike facilities are pointless for some users if they are inefficient and don’t connect. I totally agree. One other weak point is that they are building a new multi-use path along Naito from Lincoln to Harrison, but then north of Harrison you have to either ride in the lane on Naito or on a narrow sidewalk until you get to Waterfront Park. I wish that the new multi-use path could extended 2 more blocks to provide a good connection to Waterfront Park. What a dramatic change this will be! Concerning the connection between the new multi-use path for bikes and peds connects to Moody cycle track where it hits the River Parkway and Naito: what a gaping hole in the obvious route this is, and an easy fix to boot. I’ve been pondering this problem for more than a year since they first released the route. Here’s what I’ve been doing so far: heading north from the bridge at Moody and Sheridan I take a right (West) and go under the interstate. I swing North on Water ave, past the International School and you’re a block away from where the harbor structure hits Naito. This seems like a no-brainer to improve the gap here (It would be Grant St). Anyone know why they didn’t? I too am confused by this connection and wished they could have just built a parallel bike/ped path next to the transit viaduct over Harbor Drive without requiring all that backtracking. You could bail off of Barbur before the Naito split and take the new pedestrian bridge down to the South Waterfront. I’m confused by your comment. Your complaint is that as part of this project, PMLR didn’t build bike lanes on Naito all the way down to Barbur? That would be quite far outside of the project scope, and not a particularly easy project given all the road spaghetti around the Ross Island bridge approaches. If you did want to use the new TriMet bridge instead of the Hawthorne Bridge, then surely you could just continue along your current route, and then turn right onto SW Gibbs, then onto the Gibbs St bridge and then onto the Moody cycletrack. I’m sure who is forcing you to take a detour via SW Barbur into downtown? Would Gibbs not work for you? I think I’m restating the obvious, but what a mess freeways have made for getting around. Congrats to Portland on this future facility! I will love using it when open. Though I have to step back and think that the CRC would have helped do similar investments in the bike, ped, and transit facilities in our downtown and Hayden Island…but unless the Portland powers that killed the CRC do not work as hard to save the $850mish FTA money with a PLAN B…then it will be hard to smile broadly at the Orange Line party. Does anyone know if advisory bike lanes are working? What’s been the verdict on the ones in Minneapolis? Under Oregon law, motorists CANNOT drive in a bike lane except under specific circumstances. (granted, that law is frequently ignored by many drivers) Since state law currently makes no provision for an exception, and since these lanes do not meet current state law, what is being done to address it, and what legal protections will there be for cyclists if one is struck by a motorist operating in the lane? And when, how, and to what degree will this concept be integrated into the DMV drivers licensing knowledge test curriculum? I’m assuming that there will have to be some sort of legal exception created to allow motor vehicles to drive upon the bicycle lane. Assuming they do, the statute regarding failure to yield to a bicycle rider in a bicycle lane will apply. Awesome report – thanks. There’s so much I didn’t know about in here, such as the new multi-use path north of the Moody cycle track. That’s going to be a big improvement over the awkward 45 degree crossing at Moody / Sheridan that exists at the moment. It will be a much straighter router towards Waterfront Park. No mention of the Trolley Trail though? Aren’t they extending that north of SE Park Avenue as part of this project? These changes are all fantastic, and will definitely improve my quality of life. Mostly due to the new bridge, which will allow me to avoid the crowded Hawthorne, and in the evening (when the Ross Island is the quickest way home) allow me to avoid the polluted Ross Island without going 3 miles out of my way. 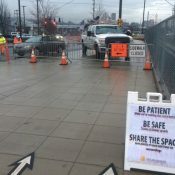 The improvements on the inner eastside also help quite a bit: the 17th/Powell underpasses and connections, the 17th ave bike lanes, and the connections from there back to the bridge. All that said, Brooklyn will still remain largely walled-off by the rail yard, McLoughlin, Powell and Holgate, with few good bike connections in and out. The connections in the 17th/Powell area are a huge improvemnt, as are the new bike lanes on Milwaukie between Powell and Clinton. However, those new bike lanes do not extend quite all the way south to Powell, and a proposed bike box there was removed from the project because that intersection needs a major redesign, out of scope for this project. To the east, the Holgate bridge is still a disaster for bikes, and to the south the improvements at 17th/McLoughlin are of limited help because 17th itself is unsafe (for non-S&F types) to ride south of McLoughlin. And of course we still have no connectivity to the west, with the Brooklyn-to-the-River project apparently on a 20+ year hiatus. Not that any of this is meant to diminish the value of the project TriMet is undertaking, and I’m glad to see them integrating in major bike infrastructure improvements. Just pointing out that Brooklyn will remain largely a walled-off neighborhood for bikes even after this project is done. My cycle to work used to take me along SE 17th, and I always found it pretty low stress south of McLaughlin. There’s no bike-specific infrastructure, but there’s no enough traffic calming to keep it a low speed road. You may be comfortable with 17th. Good for you. Some are, some aren’t. I’m not. I will ride neither 17th (south of McLoughlin) nor Milwaukie unless I’m in a huge hurry. Otherwise, I cautiously take the sidewalk for a few blocks and get on the side streets as quickly as I can. Interesting. I ride 17th in Westmoreland frequently, sometimes with my son (age 10) and don’t find it particularly scary. It’s not the most fun street in Portland, but with the speed bumps it’s really not that bad. And we’re generally only on it for a few blocks, just to cross McLoughlin into Brooklyn. FWIW, we rode to Tabor today from Westmoreland, using the new 17th street overpass over Powell. It was REALLY nice and so much more convenient than going around via Bybee/26th like we had to previously. That’s a great analysis. I’ve always noticed the same and wondered how all that area so close in still have such inferior connectivity. I live near 30th & Holgate, and feel like that area is also going to continue to be walled off by the brooklyn yard bridge. You can head north or south and find a connection (Clinton or Bybee) but that 17th & Holgate stop is just gonna be unpleasant to try to get to from the east. City did not seem too interested in connecting all the residents East of Brooklyn Rail yard to the Max Orange Line. Go to the next Powell Corridor meeting and speak up. Sean, been there, done that. I’m concerned with the area South of Powell. Have been through this with COP and Tri-met in the Orange line inner SE station planning meetings. Like I said, they are not especially concerned with connecting the city’s residents East of 26th Ave by foot or cycle to Orange lines in SE Portland. Good to hear that the SE 17th overpass will eventually bypass Powell altogether, because I refuse to ride one inch of that street. As-is, it’s kind of awkward, especially southbound (gonna use the sidewalk anyway), but even after the MUP it’s not clear how you’re supposed to head south on 17th: do you cross to the right side before or after Powell? 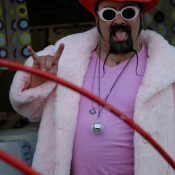 Now as meta-criticism, it was just three weeks ago that BikePortland had its “Special report: How Portland stopped building neighborhood greenways” specifically mentioning “…sacrifices the city has made in order to fulfil [sic] the $100 million commitments of former Mayor Sam Adams to the new Sellwood Bridge and Orange Line MAX”. But that was then, this is now. Today, the Orange Line is a boon. Maybe soon we’ll see something about the Sellwood making Riverview’s West Hills passage and future trails more accessible from the eastside. The only real benefit I’ve seen with the greenways was pretty recent with the speed limit reductions. But then again I’ve yet to see or hear of anyone getting a ticket on these streets. I guess the destination signs are nice, but really aren’t too necessary, and as it stands many of the greenways are pretty hard to keep track of without a map or previous rides through the area. I’d much rather see the money used for greenways spent for bigger projects like this one and more direct access to commercial districts. I mean powder coated bike frames stuck to telephone poles are nice (I guess) as well as the toppers to the street signs. but I wouldn’t miss them and often wonder how much new curb or lane paint they could have been elsewhere. Greenways have always felt a little bit like a cheat to me, kind of the Cliff Notes version of bicycle infrastructure design/engineering. Honesty, I don’t think the greenways are all that great. In reality, isn’t every side street and alley a greenway? All the new infrastructure is great… it’s just so sad that they tore out one of the best skate parks in the City to build it, in the Clinton Neighborhood. I am really bummed they closed off Division ace at Division Street. You used to be able to bike between the ONSI neighbourhood, and the Los Gordotos neighbourhood, on that little section of Division Place. Now there is a rail line in the way and the only way to get there is by jogging onto the wide part of Division before it curves to head east at the Ford Building. Naturally, that road has zero bike lanes, so… Um… Yeah. One of the “secrets” of the CRC that most people chose not to believe is that it would have greatly improved bicycle and pedestrian access over the Columbia River. As one who used to commute daily by bike over the I-5 bridge, I was looking forward to that improvement. I find it ironic and frustrating that so many on this site hated the CRC while so positive about the Milwaukie project. J-R, that’s because the CRC project would have taken us substantially in the wrong direction in terms of car dominance, while the PMLR project does not. I absolutely LOVE the new bicycle viaduct from Lincoln & Naito that takes you all the way to the new OHSU buildings at the South Waterfront. For some reason they put rail tracks on it, so be careful. Southbound, you can coast all the way and build up a lot of speed. Sounds great! Some of these improvements (like the advisory bike lanes) are very popular in The Netherlands and other parts of bike-friendly Europe. Glad to see them coming to Portland. One more reason Portland is my favorite American city! Bicycle and mass-transit friendly! There will be a MUP that will parallel the Freight and LRT tracks just to the south of them, from the intersection of Division Place and 9th, to the intersection of Gideon/Clinton and 11th, to make the connection to Clinton. Ah, but no mention of the Brooklyn St. UPRR pedestrian bridge that was *removed*. Imagine if this whole project had been built without the train component; a bike and pedestrian super-highway from Milwaukie and SE into downtown.